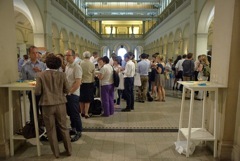 The 21th Annual meeting of SRA-E took place in Zurich from June 17-20, 2012. The theme of the SRA-E conference was Risk and Society: Decisions & Responsibilities. The conference attracted over 200 participants from 28 countries. Assisting with the conference, SRA-E was fortunate to enjoy the generous sponsorship of the Swiss Federal Office for the Environment (FOEN). Other sponsors included the Federal Office for Agriculture (FOAG), the Federal Office of Public Health (FOPH) and Swissnuclear. The conference brought together researchers as well as representatives from government, business and non-governmental organizations for three days of intensive discussions. The conference started with a welcome reception at the restaurant Rigiblick on Sunday, 17th June2012, supported by the City and Canton of Zurich. The welcome reception was open to all conference participants and provided the opportunity to meet other conference participants at a great location with stunning mountain views. The scientific program was particularly fascinating this year – with excellent, well received keynote speeches from Professors ValerieReyna (Cornell University), John Adams(University College London), John Graham (Indiana University), Adrienne Grêt-Regamey (ETH Zürich), Michael R. Greenberg (Rutgers University) and Wolfgang Kröger (ETH Zürich). Other invited speakers at the conference included Ortwin Renn, Ragnar Lofstedt, Raffaele Chiacchia, Bruno Merz, Pius Krütli, and Niels Holthausen. The poster session on Monday, June 18th, was accompanied by a reception, which was kindly sponsored by the Journal of Risk Research. For the first time, participants could vote for their favorite poster during the poster session. At the SRA-E annual General Assembly on Tuesday, June 19th, the SRA-E student scholarships were awarded to Madeleine Baker-Goering (Duke University), Rachel Southworth (Cardiff University, UK), and Jesica T. Castillo-Rodriguez (Polytechnic University of Valencia, Spain). They will receive a contribution worth 500 euro to their conference expenses. The “Best Poster Award” was presented to Mary Collins (University of California, USA). The conference dinner was held at the Acqua restaurant on the left shore of lake Zurich on Tuesday evening. The location of the dinner allowed for a nice walk to get some flavor of the city. The Law and Policy Specialty Group, the National Capital Area Chapter of the Society for Risk Analysis and the Maastricht University kindly sponsored the accompanying reception. The 22st SRA-E conference is already in the planning stage and will be organized in Trondheim, Norway, on 17-19 June 2013.